It's backkkkkkk!!! Hope i can find a nice customized pair again this year! 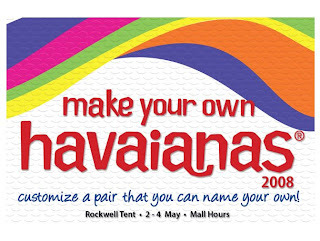 Make Your Own Havaianas is an event which will run from May 2 to 4, 2008 at the Rockwell Tent where you can customize your own pair of flip-flops. 3. Choose your embellishments – letter-pins to spell out your name, lifestyle pins to reflect your personality, Swarovskis to express your chic. 4. Our friendly staff will assemble your special pair on the spot. 5. If you wish to embellish your pair with Swarovskis, proceed to the designated station. 6. Lacinhos (“little laces”) are also available to dress up your customized pair. 7. Purchase your exclusive creation for only P795.00 (Adults sizes from 33/4 to 45/6) and P745.00 (Kids sizes from 25/6 to 31/2) without embellishments; an additional P50.00 for each pin or each Swarovski will be charged. Purchase of lacinhos will be an additional P200.00 per pair (a pair of lacinhos per pair of slippers will be allowed). ** The event now offers Adults & Kids sizes and Top & Slim styles. Ive been waiting for this event! I thought they wont have it this year since march has elapsed. Yeyyy! Thanks for the info. Is there an entrance fee? I'm so jelly! I want a pair too :P! Make sure to take a pic of yours if you get one =)! surely sands!! im so excited for it!! Wow.. This is great! I can say that the lightness of their material keeps one on the go and the appeal of their creative patterns and designs keeps one looking trendy.